The weather for Super Bowl XLVIII may be a large factor in secondary-market ticket prices dropping. 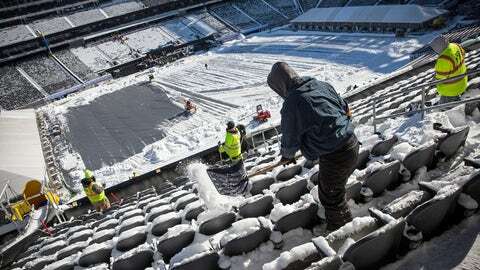 This cold-weather Super Bowl may not be such a hot ticket, after all. Prices on the secondary market are falling faster than the snow in the New York-New Jersey area has this week. At the time of this article, fans could get a pair of seats to the game for $1,595 each on StubHub with many of the cheapest seats in the $1,700 range. On SeatGeek.com, the cost is slightly higher, with the asking prices starting at $1,600 per ticket. This is a steady decline from what prices were prior to last Sunday’s AFC and NFC championship games. A cursory look by this writer last Sunday showed the cheapest tickets — before the Broncos and Seahawks had locked up wins — in the range of $2,500 per ticket. As of Jan. 24, the cheapest ticket listed on NFL Ticket Exchange (the league’s official resale site) was $1,779. That is $409 cheaper than the cheapest ticket on the site with nine days remaining before the big game last year and $809 cheaper than two years ago. Furthermore, the cheapest ticket was $2,700 the day after the conference championship games ended, so prices are falling fast. Darren Rovell also tried to shine light on the situation with this tweet. Currently, Accuweather.com has a projected high of 36 degrees with a chance of snow showers for Feb. 2. The focus on weather, travel and possible postponement may all be contributing to the drop in prices. “Without a doubt, as much as everyone thought going out years in advance in purchasing blocks of hotel rooms, there is actually tons of space,’’ said Robert Tuchman, president of Goviva, which arranges packages for companies and individuals around big events. He has worked every Super Bowl since 1997. Even Rams punter Johnny Hekker, who has four Super Bowl tickets, is trying to find buyers for his tickets on Twitter.